Safavieh Lighting 28-inch Morocco Mercury Glass Table Lamp (Set of 2) - 15" x 15" x 28"
Safavieh Lighting 28.5-inch Antique Silver Mercurio Double Gourd Lamp (Set of 2) - 15" x 15" x 28.5"
Unify a lighting scheme in your living room, bedroom, or home office with this set of Morocco table lamps. Made of sturdy glass, this set of silver-hued lamps includes compact fluorescent bulbs for energy efficiency and white cotton shades that evoke coastal or sailing sensibilities. I searched high and low for elegant mercury glass lamps for our formal living room. Some mercury glass lamps were too shiny/sparkly silver, and others I had seen were too "spotted" in a way that makes them look cheap. These lamps were just right as ar as the mercury glass, and I like the classic, elegant silhouette of the lamp. The subtle and elegant mercury glass lamps blended well in our living room which is taupe and ivory, with silver accents. The only issue for us is that this lamp looks too small for our particular end tables, and too small for our room where they unfortunately seemed lost. Also the pair of lamps we received were approximately 26" instead of the 28" mentioned within the description. If the lamps were larger in height and in depth, we would have been thrilled to keep these pretty lamps. The price for this set is fantastic too. We were upset that the size didn't work in our room since we loved them. I ordered them in middle of the night on a Monday (technically Tuesday) and they arrived Wednesday morning. Wow! They were packed very well, easy to assemble too. They are absolutely gorgeous. They were much bigger than I thought they would be and I was startled at first, thinking they might look too big on my bedroom nightstands. However, they look great. The add opulence to the room because of their large scale. I have a Cal King bed, so the size wasn't an issue after all. They are very bright. I wish they had a 2 way setting to dim it a little, but I guess you could also just use a softer bulb. The bulbs that came with it are quite bright. Good for reading I suppose. If you're looking to add some bling to your room then i highly recommend these lamps. Well made, crisp white shade and give off great light! I am thrilled with these lamps! They were just like some I saw at a major retailer except those were 4X the price these were! The mercury glass is my fave and these are just exceptional quality and so so easy to put together. They even came with light bulbs too! A buy you just can't beat! Super quick shipping too which I loved! Let me first say that the delivery timeframe was fast and stress free. The lamps are simply gorgeous, after assembly I could only stare in amazement. 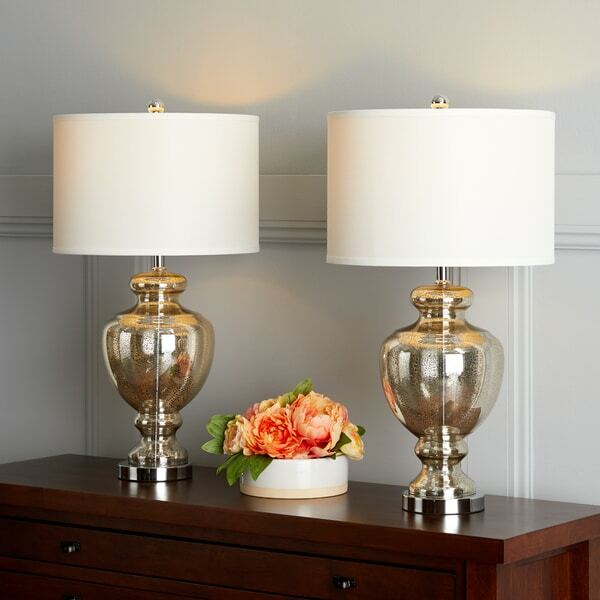 The lamps are clear glass but have a subtle pattern in gold/bronze that will complete any decor. Stunning! 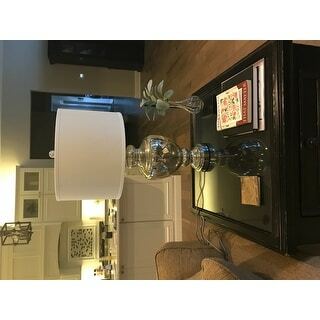 So happy I purchased these lamps and you will be as well!! These lamps are just what I needed for my Living Room with new gray paint and a darker gray accent wall. They look so elegant; much more than what I paid for them. They are a bit shorter than the lamps I had there, but that really doesn't matter. I'm so happy with these lamps. I'm editing my original review: About 5 days after I got these lamps, the top third of one of the lamps exploded in the middle of the night! The lamp was not on and no one was around it. I called Overstock and they promptly replaced the defective lamp and paid for the return shipping. I had my new lamp in less than a week! I left it sitting in the same spot for at least 5 days before I removed any wrapping (just in case). So far, it's been fine. As I said before, these lamps are so elegant. I would probably not put them in a place where children would have access to them because the glass is so thin. These were a bit bigger than I was expecting- but they are absolutely STUNNING and so well made. They look like they could be in a luxurious hotel room and are the perfect addition to my bedroom. I believe they could be multi functional in the future and would look great in a living room too. The lamp cord is a tough fabric covered cord, super well made. The lamps are expertly packed and really easy to assemble. They even come with bulbs. Such good bang for the buck! Great Lamps. I am pleased with the quality of the shades as they don't block the light. The mercury lamps exceeded our expectations! They are beautiful! The cake very well packed and are a perfect height for a bed side lamp! Classy and gorgeous! Highly recommend! Love these lamps!! They were packaged excellent! They paid attention to details which I really love, down to the braided electrical cord! Now I just need my electrician to install floor outlets so I can start using them! Lamps came earlier than expected. Well packaged to protect them. I am very happy with these lamps. Beautiful shape, size and shimmer! Beautiful lamps, but one completely stopped working within 2 months and sparks when we try to turn it on. Customer service said that the best they can do is a 12% off coupon Since we are past the 30 day return policy. RIDICULOUS that if a product is DEFECTIVE, they will not replace. These are beautiful, large (tall) and high end lamps. They are a good buy and a quality product. I would buy them again. I put them in our guest room and they look fabulous! Love! Just perfect lamps! Do not hesitate to purchase. They come very well packaged along with a bulb for each lamp. 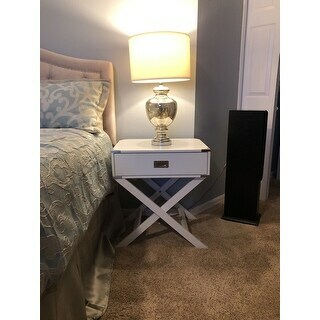 Perfect accent for a living room or bedroom. I bought these as a gift for my sister. The lamps are very elegant, the picture doesn’t do them justice. They can be integrated into many different styles of decorating, very beautiful lamps. Beautiful lamps they look very very expensive.The mercury glass has just enough bling yet not shiny that has a stately transitional look with a touch of glam. GREAT find for the price. Another site has them for more. Absolutely beautiful, easy to assemble and packaging was done extremely well. Just the right size. Will be getting another set for my guest bedroom. Typical mercury glass look, heavy weight. These are beautiful! They look great in my master bedroom. I definitely recommend these mercury glass lamps if you are looking to add some beauty and drama to any room. Reviews were so positive that they convinced me to purchase. "Do these lamps require only CFL bulbs? How can you get a brighter light? Thank you. Love the lamps. " 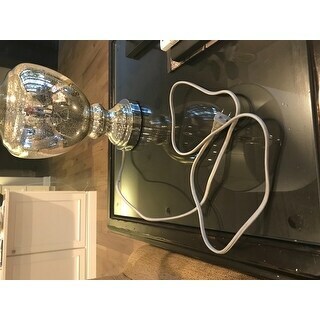 Safavieh Lighting 28-inch Morocco Mercury Glass Table Lamp - 15" x 15" x 28"